Myelolipoma (ML) is a benign mesenchymal tumour composed of mixed mature adipose tissue and haematopoietic elements.,,,, Usually, it is located in the adrenal glands; extra-adrenal location is very rare, and includes the mediastinal compartment.,,, Pathogenesis of mediastinal ML has not yet completely identified. Various pathogenetic mechanism have been proposed. ML usually has an indolent clinical course with a very good prognosis. We describe a very rare case of mediastinal ML successfully resected by video-assisted thoracic surgery (VATS). A 65-year-old male, never smoker, with no significant past medical history, presented for radiological finding of a posterior mediastinal lesion. The patient complained of persistent low back pain for a few weeks. A chest-abdomen computed tomography-scan revealed a partial enhanced, smooth, solid, well-demarcated 2.2 cm × 1.2 cm lesion in the left lower posterior mediastinum at the level of D9 thoracic vertebrae [Figure 1]a. Magnetic resonance imaging revealed low signal intensity on T1- and T2-weighted images; no sign of invasion of the intervertebral space and vertebral body was observed [Figure 1]b, [Figure 1]c, [Figure 1]d. A VATS surgical resection was performed [Figure 2]a and [Figure 2]b. The patient was discharged uneventfully on the post-operative day 3. Macroscopically, the surgical specimen were round-shaped, well-encapsulated, purplish nodules, with a soft consistency, measuring 3 cm × 2 cm and weighing 8 g. Microscopic examination revealed well-defined nodular lesions predominantly consisting of adipose tissue, admixed with haematopoietic tissue, which was represented by erythroid, granulocytic, and megakaryocytic series. By immunochemistry, the observed positivity for glycophorin A, CD71, myeloperoxidase and Factor VIII confirmed the presence of erythroid cells, granulocytic lineage and megakaryocytes, respectively. CD34+ cells were found to be <2%. Initially, extramedullary haematopoiesis was considered, but no lymphadenopathy or hepatosplenomegaly were found. Moreover, the bone marrow biopsy showed no alterations and the search for mutations of JAK2 (V617F) was negative. Finally, a diagnosis of ML was formulated. Eighteen months later, the patient was asymptomatic and no sign of recurrence was found. ML is a benign mesenchymal tumour composed of mixed mature adipose tissue and haematopoietic elements.,,, It was first reported by Gierke in 1905 and named by Oberlin in 1929. ML mainly occurred in adrenal glands with an incidence of 3%–5%; the extra-adrenal location is very rare, with a reported estimated incidence of 0.08%–0.2%. Intrathoracic ML s have been very rarely encountered: 28 cases of mediastinal ML s have been reported in the literature by Xiong et al. in 2014. Most of them arose from the posterior mediastinum (93%); there were 12 females and 16 males with a mean age of 64 years old and the tumour diameter ranged from 1.5 to 25 cm (mean, 5.9 cm). Pathogenesis of ML is not well known; a number of hypotheses were proposed. Since the majority of these tumour s were found to be attached to vertebral bodies, we think the most reliable hypothesis was that haematopoietic tissue might project from vertebral microfractures to paravertebral space.,,, Moreover because ectopic haematopoietic tissue may include stem cells, they would be the origin of ML formation. Most cases are asymptomatic and incidentally detected; when present, symptoms are unspecific such as dyspnoea, chest or back pain, haematopoietic abnormalities and cardiovascular disorders. Macroscopically, ML are well-defined tumour s often surrounded by a thin capsule. The histological examination shows the varied proportion of haematopoietic tissue intermingled with adult adipose tissue. The haematopoietic component is recognised by the presence of erythroid, granulocytic and megakaryocytic series. Since primary mediastinal ML is a very rare finding, lymphoproliferative disorders, neurogenic tumour s, malignant mesotheliomas and extramedullary haematopoietic tissue have to be considered in the differential diagnosis. ML should be first differentiated from extramedullary haematopoiesis. Histologically, ML is composed of abundant fat tissue and a small amount of normal haematopoietic elements. In contrast, extramedullary haematopoiesis shows markedly different characteristics, commonly combined with abnormal haematopoietic components and erythroid hyperplasia. In addition, most patients with extramedullary haematopoiesis usually present with some primary blood system disease, such as hereditary spherocytosis or Mediterranean anemia. No standard treatment exists. However, as tumour size might range from 1.5 to 25 cm, once mediastinal ML is found, surgical resection is recommended.,,, Whenever feasible, a minimally invasive approach should be the first choice. No malignant transformation of primary mediastinal ML has been reported so far; therefore, long-term prognosis is very good. Hosaka T, Hata Y, Makino T, Otsuka H, Koezuka S, Azumi T, et al. 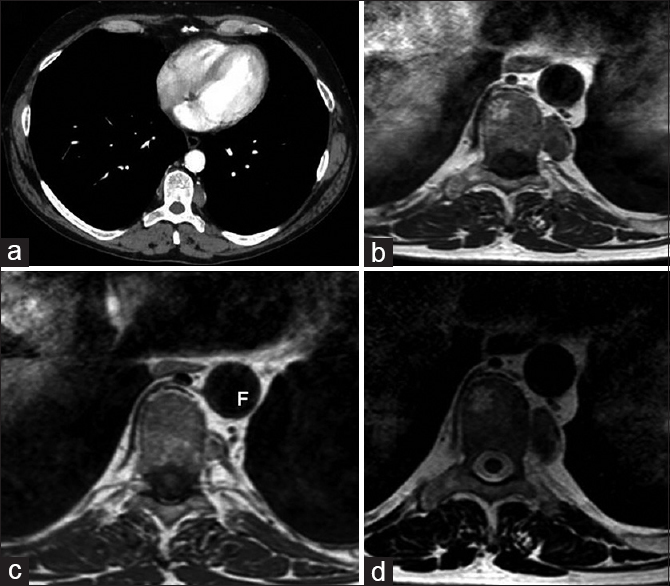 Mediastinal myelolipoma showing gradual enlargement over 9 years: A case report. J Cardiothorac Surg 2016;11:91. Himuro N, Minakata T, Oshima Y, Tomita Y, Kataoka D, Yamamoto S, et al. Video-assisted thoracic surgery for primary myelolipoma of the posterior mediastinum. J Cardiothorac Surg 2016;11:1. Xiong Y, Wang Y, Lin Y. Primary myelolipoma in posterior mediastinum. J Thorac Dis 2014;6:E181-7. Lin F, Pu Q, Ma L, Liu C, Mei J, Liao H, et al. Surgical treatment of primary mediastinal myelolipoma. Interact Cardiovasc Thorac Surg 2015;21:206-10. Al Harthi B, Riaz MM, Al Khalaf AH, Al Zoum M, Al Shakweer W. Adrenal myelolipoma a rare benign tumour managed laparoscopically: Report of two cases. J Minim Access Surg 2009;5:118-20.